The wait is over and now we are back to the grinding! This early in a major event, there is no way to know if EA has made any huge changes or not…like how many items we are going to be allowed to place before we hit the limits again…or how much land they’ll give us to place the HUGE list of stuff we see coming down the pike. But, you CAN bet that there will be a lot of grinding. And, if you WANT IT ALL you are going to have to drop some donuts (purchased or farmed) over the next six weeks (yes, this one is “shorter” than a few others we have had). And…yes…because so many of you complained about the “Do It Yourself” Calendar I did at the end of the last event (which some of you also loved) I am willing to compromise, and combine the “Artistic Freedom” of the big calendar, and the “convenient simplicity” of the digital calendar…into one calendar of function and beauty. 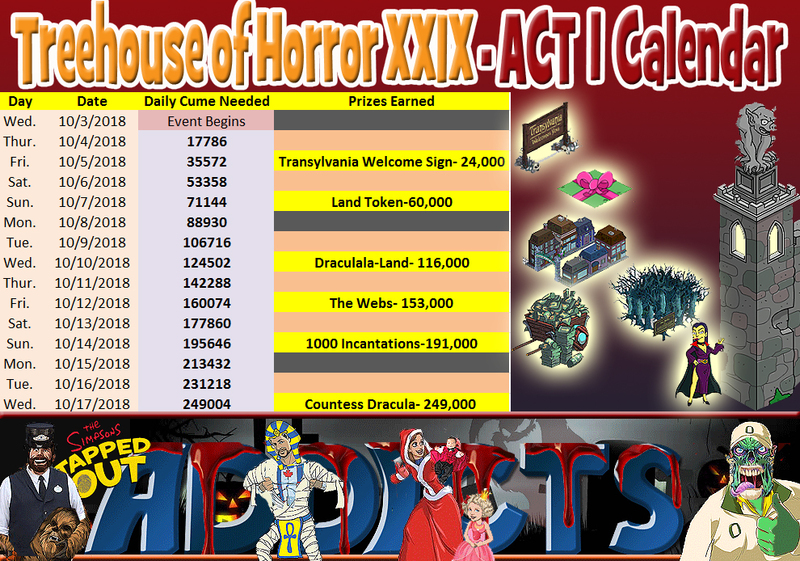 Here is that calendar, and all of the numbers you need to stay on track with the main prize track! Yes…doing a spreadsheet calendar is way faster than doing a regular “Gregorian” calendar. But let’s face it…Pope Gregory had a heck of a lot more time on his hands back in 1582 than I do today. I mean, what did a Pope have to do back then? The Bible was already pretty much put together by a handful of Popes, thanks to the good work of St. Jerome in 400 AD. And the Spanish Inquisition had been over for almost 50 years. So, if you are a Pope, and want to make a real change in how you keep time…Pope Gregory had the time to do it right! Want to know more about the origin of the Gregorian Calendar? CLICK HERE to find out Six Things You May Not Know About The Gregorian Calendar! It’s fascinating stuff!! Oh. Wait…you don’t care about history? You JUST WANT THE NUMBERS?? 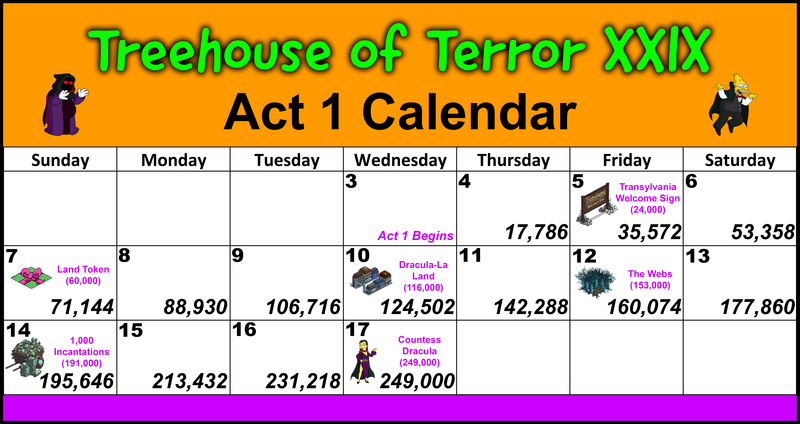 OK… then click the graphic below for a full-size version of the ACT I calendar from the Treehouse of Horror XXIX. And yes…those are Roman numerals…which is part of the very thing that Pope Gregory was trying to change! As usual…the numbers seem daunting. But, I am going to take a wild guess, that if you log on every 4 hours, at least 4 times a day, you are going to be just fine. 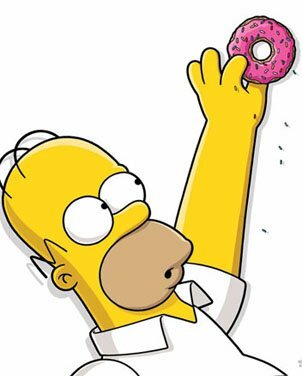 This event may not be entirely “Simpsons Canon,” but I actually think it looks fun! Give me old school scary over the silly slasher/super-hero/Potteresque stuff of today any day! Have fun! It’s all about finding the time to grind… and you WILL! Stay safe. Don’t tap and drive. And thank the guy who invented the Digital Spread Sheet (Dan Brickland). In my world, whipping out the chart in Excel, instead of going the way of Pope Gregory is a winner every time! And NO Scissors Required! Time saved…allows for more time grinding. Right? This entry was posted in Tapped Out and tagged Tapped Out Tips and Tricks, The Simpsons, The Simpsons Tapped Out, TSTO, TSTO Act I Calendar, TSTO Addicts, TSTO Community, TSTO Countess Dracula, TSTO CrankyOldGuy, TSTO Halloween Event 2018, TSTO Patric, TSTO Tips & Tricks, TSTO Tips and Tricks, TSTO Treehouse of Horror 2018, TSTO Treehouse of Horrors XXIX. Bookmark the permalink. Thank you Alissa! ❤ I did look for a post for some time, but failed to find it. It seems that the new items don’t unlock at level 4 crafting any more, we need act 2. Could anyone please tell me if I can save my pickaxes AND my incantation bracelets or with either or both disappear when act 2 starts. If I can keep them I will but if they’ll disappear, I’d like to spend them before. Thank you in advance for any advice or thoughts. Not a complaint but a question. Why is last Wednesday treated as a full earning day? Act 2 according to the timer starts early morning of that Wednesday. So doesn’t that throw off the calculations? Just wondering if you know something about the end time that maybe I’m missing. Thanks for your hard work. This has been discussed extensively. Because EA starts/ends updates in the mid morning…the calendar runs for 14 days…no matter what your time zone. Sooooooooo. The first day (start day) is a half day, as is the end day. I used to do them with a fractional number of hours…and decide the final needed cume by that…but it made people nuts. So……. now I just devide by 14 days…even though it really could appear at 15 on a Gregorian calendar. And let’s not start that debate again. Bottom line… play every 4 hours and you’ll be days ahead. I got the Countess Friday. Please bring back the Monthly Gregorian Calendar break out. I have used that for every event for years. Visual learners do not process lists well. Please bring that back, I don’t like the list format. Old habits die hard. Pope Gregory is dead. Don’t blame your difficulties with time management as an excuse to produce a sub-par post. Maybe spend less time rambling on Friday and more time giving your readers the information they want. I think it would a GREAT idea if you found your information from another free source…as we don’t meet your lofty standards of excellence. Oh…and don’t blame your parents for such poor manners. I keep forgetting…this is the Internet. And that means EVERYONE has the right to whine and complain. But, hey…you’re special. Right? You’re “puckadelic” from Michigan! You…rock the web. The first 2 days, the event menu showed in the store and I was able to purchase characters and some of the mystery boxes. Then it suddenly disappeared and I can’t get the rest of the characters and mystery boxes. I tried reinstalling, no luck. No one else I know has this issue. Thanks for the calendar, Patric. 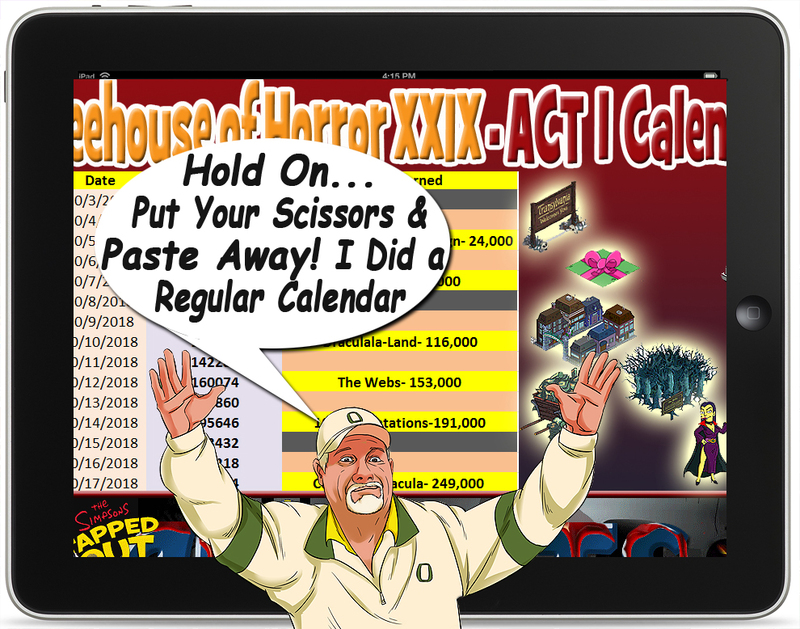 Usually I’m a few days behind the Act 1 calendar but now I’m right on track with it because I got the land token today and I thought I needed to get the third prize today instead because I have not seen the calendar since Thursday. It is probably that the totals for the prizes are much higher than previous events but at least the currency has increased from character tasks, friend visits and the other ways of earning currency. I do wish that EA were more generous with the land tokens since I can see that there are only 3 available in this event (1 per act) unless I’m missing other tokens available in this event. Yep! Numbers are relative in this game. 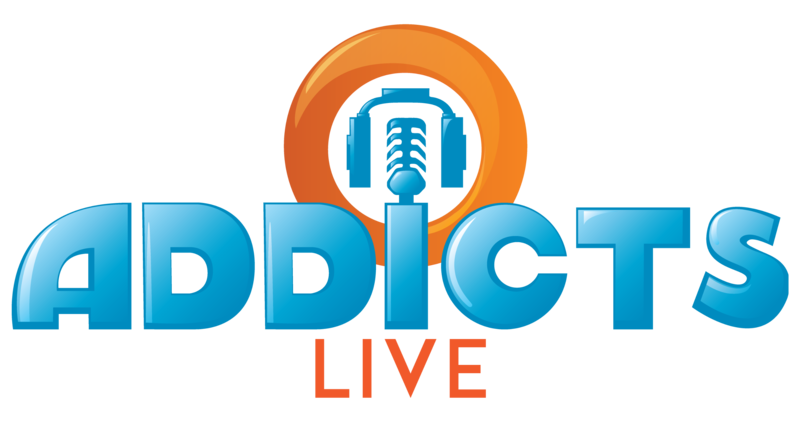 Higher goals…but higher payouts too! Is 75000 good for Sat? Fascinating Gregorian stuff! Calendar is awesome, thanks! Let’s leave Patric alone about posting the Gregorian calendar and create one ourselves. I’ll take this act. Who wants to volunteer for the second act? Aw you did a great job! Thank you! My brain was having issues with the list and I’ve been so busy that I only got in 3 times yesterday so clearly I hadn’t had time to draw it out. it was on the to-do list. Thank you so much for sharing! You’re very kind! I love this format, not least because I’m not American and occasionally need a moment with things in US date format. Let me know if you don’t get a volunteer for Act 2 and I’ll give it a crack (I haven’t used imgur before but assume it’s not particular complicated…). Thanks Patric! You are the best! I really didn’t say that. I chose not to use Grandpa…and use the Premium character in replacement. Had I gone totally Freemium with Grandpa in the mix, my results wouldn’t be much different. I get so stressed about my progress. I’ll never make it!!! Then I see the calendar and see I’m ahead of schedule. Thanks Patric. Today is finally the day I am going to be on track instead of behind! I know it’s slow going at first with these events until you build up more bonus area percentage but I still hate being behind! So happy for the calendar! I pounce on the first post with the total needed and also make my own spread sheet in Excel because I am a true nerd! I even break down the amounts I need depending on if I log in 4 or 5 times a day! Excessive, I know but I like knowing each time I log in if I’m on track or behind! But I love when your calendar is posted and we match! Thanks for the hard work! 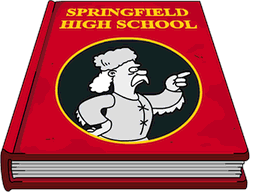 So… what is Springfield going to do with a quarter million sets of vampire dentures anyway? Hmm… I’ve been going on to this side for the calendar for years because I like that calendar style. It’s easier for me and I know for some others too as per their comments. Please have that back. For those who might reply that the list is the same, well it is for you but not to me. Anyway, thanks again for doing the math. Am I allowed to complain that you only did a list & didn’t make a real calander this time around ? For whatever it’s worth? I’m okay with a list. I was going to write the totals on my calendar, just hadn’t gotten there yet. Life is busy the latter half of the week. No, you won’t. Go Patric! Patric, as usual, YOU’RE THE BEST! Thank you!! Well. Just one of Alissa’s minions.